Former British Prime Minister Tony Blair, former Australian Prime Minister John Howard and former Philippine President Fidel Valdez Ramos joined Haruhisa Handa, the chairman of Worldwide Support for Development, or WSD, to discuss globalization and world peace at a symposium in Tokyo on Oct. 17. 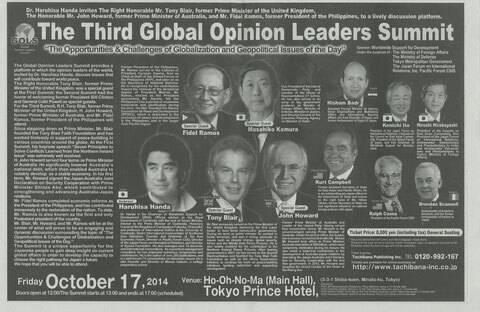 The WSD, a nonprofit organization assisting disadvantaged people and communities throughout the world, hosted the Third Global Opinion Leaders Summit, titled “The Opportunities and Challenges of Globalization and Geopolitical Issues of the Day,” at the Tokyo Prince Hotel in Minato Ward. 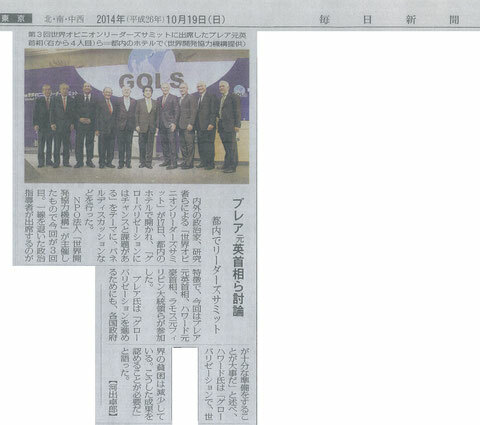 The former country leaders and other prominent speakers, including former Minister of Foreign Affairs Masahiko Komura, participated in the discussions. In his opening remarks, Handa, who served as the emcee and panel moderator, touched upon the nature of globalization over the past few decades. Economically, trade volume has surged and international companies not only sell the same mass-produced products to many countries, but also customize their products and services to each country, he said. Politically, global leaders aim to maintain a balance between globalism and nationalism. 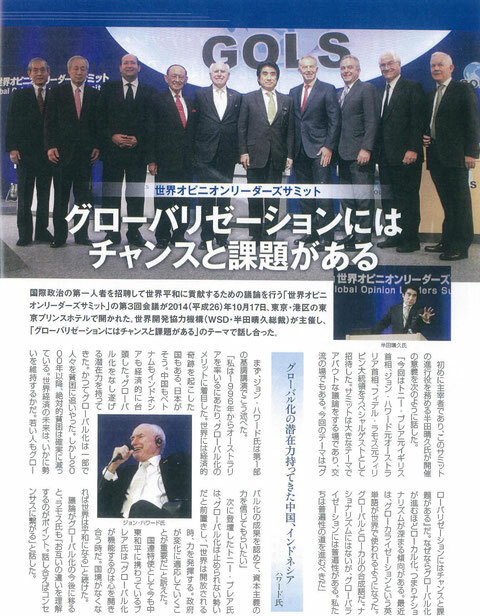 After Handa spoke, Howard, who is now the chairman of International Democrat Union, spoke further on globalization. He also said preserving a good relationship with Asia is geopolitically very important for Australia. Particularly, Indonesia, the most populous Islamic country and a close neighbor, is important for his country, while Japan has always been a good friend to Australia, he said. To cope, countries have to prepare for globalization, and the most important thing is to educate people to do that, he said. Great economic achievements over the last 30 or 40 years stem mainly from free trade among countries, clearly making free trade agreements very important, he added. Asked about terrorism by Handa, Blair pointed out that people need to understand that they have differences and be taught that everyone should be treated equally, regardless of those differences. He then pointed out that the world must work together to tackle Ebola, international terrorism, climate change and poverty. 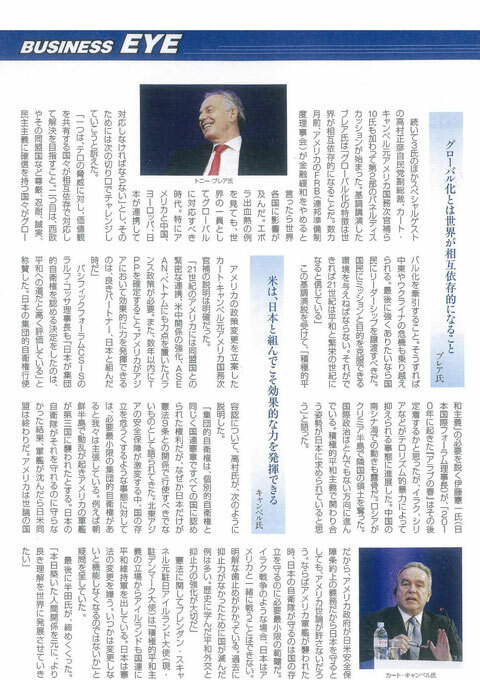 On the environment, Howard expressed his view that environmental friendliness and economic development may not be compatible and, for example, nuclear power is necessary to solve world energy problems. After an intermission, the second half of the summit began with a speech by Blair. “There are many characteristics of globalization. The most obvious one is that globalization makes the world interdependent,” he said. When the U.S. Federal Reserve talks about quantitative easing, the global market reacts. The reaction to the Ebola outbreak must also be global, he said. He expressed concern over terrorism by the Islamic State of Iraq and the Levant and the Ukrainian conflict. In considering solutions, Blair said the education of young people, no matter where they live, is important. “Even though these issues originate in the Middle East (and other far-off lands), they are relevant to you. You must be engaged,” he said to the audience. It is also important that developed countries and their allies stay strong in tackling international terrorism. In this sense, it is important for the EU to get back on its feet, he said, seemingly referring to recent economic weakness and conflict surrounding Russia over the Ukrainian situation. 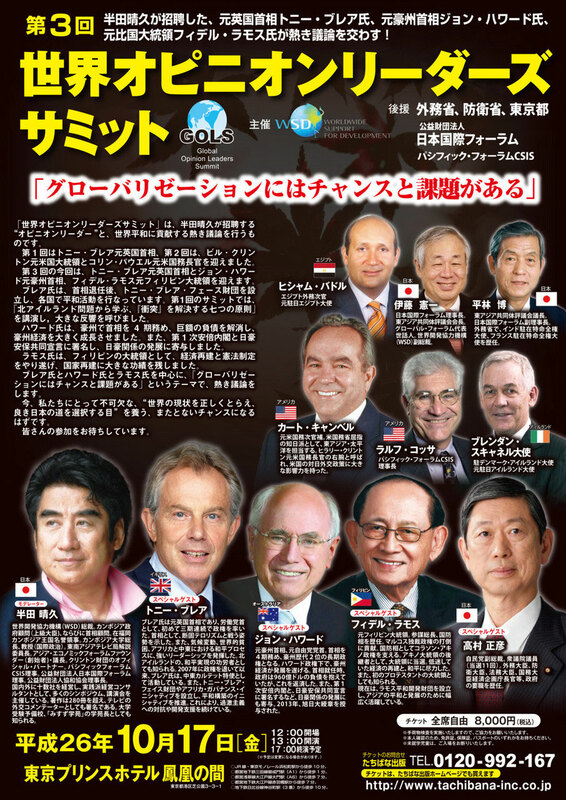 After Blair’s speech, there was a panel discussion attended by Blair, Howard, Ramos, Komura, Kenichi Ito, president of The Japan Forum on International Relations, Hiroshi Hirabayashi, president of the Council on East Asian Community, Kurt Campbell, former assistant secretary of state for East Asian and Pacific Affairs, Pacific Forum Center for Strategic and International Studies (CSIS) President Ralph Cossa, Irish Ambassador to Denmark Brendan Scannell and Hisham Badr, assistant foreign minister for International Institutions and Organizations of Egypt. Komura discussed collective self-defense, which Prime Minister Shinzo Abe’s administration decided on July 1 the government could exercise by altering its interpretation of the Constitution’s Article 9, which renounces war forever. The change means that Japan can now defend its allies, U.S. troops for example, even if Japan itself is not under attack. The summit was attended by 1,800 people, including participants of the Young Leaders Program of Pacific Forum CSIS, based in Honolulu. The WSD engages in a variety of charity activities in Asia, Africa and other regions of the world, including donating to a nonprofit organization that works to eradicate AIDs and assists AIDS patients in Lesotho and the Red Cross and other organizations at times of natural disasters.